Excel Display manufactures and provides a full line of industrial flat panel displays and monitors from 1.5 to 20 inches diagonal viewing area. Touch screens are available as a value added custom feature on some models for OEM and ODM requirements. Driving boards are available that supports NTSC/PAL or digital signal for desk and lap top, kiosk, industrial single board computer, SBC, PDA among other applications. If you are looking for a full panel solution that includes the TFT Panel, drivers, and a frame please also see our Open Frame TFT page. Excel's TFT panels are ideally suited for Audio Visual applications where a full motion NTSC or PAL signal needs to be displayed. These panels will interface to a driving board, or contain drivers within the module, that will interface via a custom cable to your RCA or SVideo signal. Excel's small reflective TFT displays are made for hand-held devices. This newest family of AMLCDs are built with a reflective backing and a front light for both day and night use. Flat panel displays are being widely used for laptop and desktop computers. 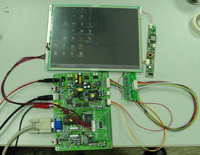 These displays are available with a driving solution that allows them to be directly connected to the standard VGA port on nearly every computer of recent manufacture.